Be Stylish and Be Authentic -- For years now men and women too from all folks of life can’t survive without a nice wallet, many prefer to go for authentic and stylish too but nothing better to go smart than choosing a wallet made of Stingray skin leather. One of the more attractive exotic skins on the market is stingray. Its beauty is tinted in several traditional and stylish wallets. It is highly durable and is having a tensile strength 2.5 times which is greater than cowhide. It’s unique flexible texture resist from tearing or puncturing and it also resist against fire and water. During olden days it has been used by Japanese as "Samurai" body shield and handles for the swords they use. 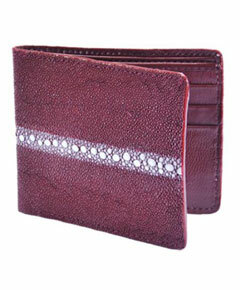 Very conventional techniques were used to make various beautiful finishing in stingray leather wallets. It includes evenly polished outlook and the feel. Polished appearance is created by sanding the innermost line of spines on the ray's back and is exclusively made from a single piece of eagle ray skin. These Stingray wallets can be the most unique leather items you’ll ever own. Facts about Sting Rays: These fishes became extremely popular for their external skin which can be used for making various accessories like wallets, handbags, mobile cases, and various ornamental products. These creatures are enormously dangerous and highly venomous when it is confronted with. And though, we should not misjudge them under any circumstances. Its skin is actually made up of a hard calcareous material that is like armor shield than the skin or scales. Because of this calcareous coating over the skin formed as a small patch of beads of various sizes, only by a professional sewing machine but not by needle, it will not stitch through the skin in a straight line as it have to move around the bumps into an area the needle can break through. Another astonishing fact is that it can live for more than 25 years and can grow up to 6.5 feet and weight ranges nearly 800 pounds and more. Stingrays are generally camouflage in nature and it is hard to find when surrounded by the mud and by the way it fills up with all the exciting facts about it. Believes in Stingray Leather: It is named as one of the immortal jewel of the sea; this wallet is believed to bring good luck in Asian cultures. This was considered to empower its bearer with strength and protection during war in battle field. Used in body armor and decorative inlays, burial place of the Pharaohs revealed stingray leather as a symbol of power and status. Usually stingray leather contains base substrate which is the authentic skin of stingray. These substrates are made of calcium and when the process of tanning takes place, it gets dried and seems harder than before. This hardness made them so attractive and this is the reason behind the usage of handles for samurai swords. Before that the raw stingray skin goes under some tanning and dying process which makes it a real stingray leather. All you need to know about the Stingray wallet: Wallets are very basic accessory to carry cash, so there is nothing wrong to change the usual things once in a while and go for something different and the Genuine stingray wallets is just the thing you must opt for. These wallets are known for their durability and style. Though they are little expensive than the other ready-made but once you buy the best one they’ll last for at least few years if taken proper care. It is considered as one of the most durable and best leather products in the world. These will help you to carry-out all essential items in place and are kept safely in your back pocket that you carry will determine it as sleek and very stylish wallet. Many handmade wallets are made by perfect customization. Those who want to hold the trend and remain their own style in dressing up should look-up for a decent and stylish wallet which is made of stingray leather. Stingray leather wallet is made from the skin of a stingray. It is strangely coarse and in fact it was used in ancient days to cover things like dagger or sword hilts, because the leather would not become slick. These wallets are naturally patterned with little bubbles commonly known as pearls. They can be dyed with some process to produce different colors or patterns. The resulting wallet is beautiful, and its owner is sure to get many compliments. Actually stingray leather is in the middle of a universal fashion revival. Its unique beauty is highlighted by the shiny pebbly texture of the skin, along with an exceptional design feature - the bony trace on the top resembles a tiny cluster of "pearls". These wallets are not very soft and smooth to handle and are known for being highly durable, many people have a preference of going for dark shades and these are just the right one but you may also check for the many colorful wallets too and they come in a variety of prices also. You’ll surely find many other stingray wallets for much lesser price but the more fancier they look the more expensive they will be. We at MensUSA particularly provide stingray customized wallet which can be identified by the continuous row of pearls throughout the center. This mens wallet is exclusive and special to every real Mens Wallets. So when you shop for wallets be sure to check for the skin wallets only. We’re very much proud for describing you about what makes these wallets a must haves and why you should consider buying at least one that’s most pleasing to you, since it’s your daily companion whenever and wherever you step out of the comfort from your home. We assure for your 100% satisfaction while purchasing online from our site. Also we will afford you with the best customer service and value added services as well.